Paul Pogba says Ole Gunnar Solskjaer has made Manchester United's players enjoy themselves since taking over at Old Trafford. Pogba has scored four goals in three games since Solskjaer's arrival as interim boss after his double in the 4-1 win over Bournemouth, with the Frenchman's rocky relationship with former manager Jose Mourinho now appearing far behind him. When asked what the Norwegian had changed since his arrival, Pogba told Sky Sports: "Maybe we have relaxed, realised we are Manchester United and to keep up you need to be on the top of the league. "It's the reaction of the players, everybody is enjoying themselves and that's what we need. The team need to enjoy their football, work for each other and that's it. That's the result on the pitch." United have scored almost a third of their Premier League goals this season in the three games since Solskjaer took over - as well as enjoying a 100-per-cent winning record so far. 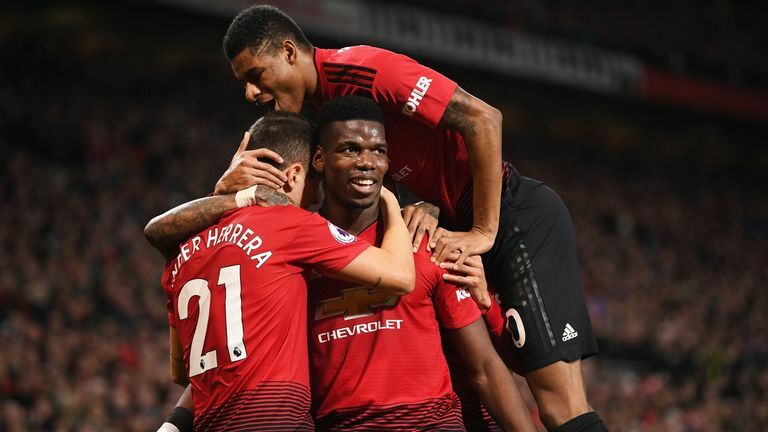 The side were regularly criticised for their brand of football under Solskjaer's predecessor Mourinho, and Pogba opened up on what has changed under the Norwegian after their third win in eight days. "It's different," he said. "We won games with the old manager, so it's just a different style of playing. We're more offensive, we create more chances, but we try to play like that. "It's how we want to play, we want to attack. The manager wants to attack and that's what we are doing."